In the movie Rush, actor Chris Hemsworth as Formula 1 racing driver James Hunt wears the full gold Heuer Carrera chronograph, first created by Jack Heuer in 1963 and named after the Carrera Panamericana Mexico Road Race. 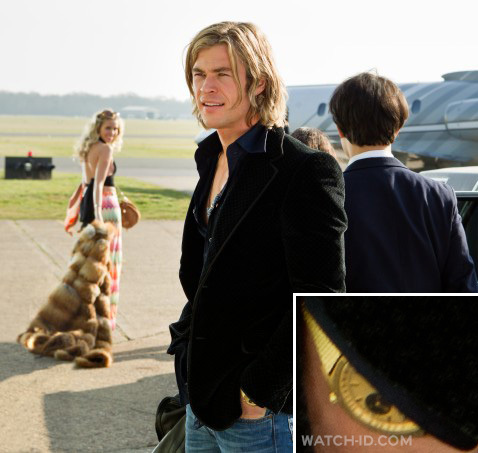 The press image released by TAG Heuer shows a gold Heuer Carrera Chronograph with gold subdials, but on another photo of Chris Hemsworth wearing the watch it looks like the watch in the film has black subdials. 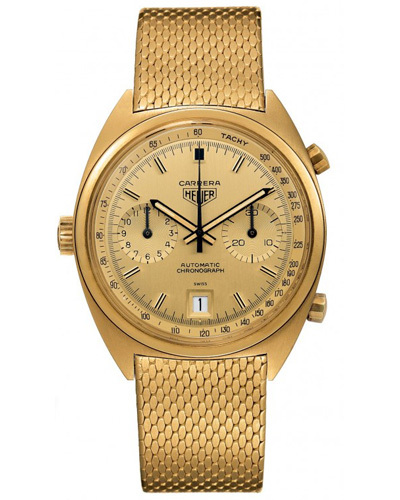 You can find a few examples of these vintage gold Heuer Carrera Chronographs on eBay. In the film, Chris Hemsworth also wears Carrera sunglasses. In its depiction of the Formula 1 environment of 1976, director Ron Howard’s Rush starring Chris Hemsworth and Daniel Brühl is historically accurate down to the smallest detail. From the cars to the clothes, every element has been meticulously researched. Not since Le Mans, the classic 1970 race film starring Steve McQueen, has a major Hollywood film more authentically recreated the intense action and glamour of the world’s fastest sport. No surprise, then, that TAG Heuer played a key role in the look of both films. In Le Mans, Steve McQueen, playing driver Michael Delaney, wore the Heuer crest on his overalls, helmet and car. When the costume department offered him a choice of luxury sports watches to wear, he naturally chose the square-shaped Heuer Monaco chronograph, the same one worn by his friend, the great Heuer-sponsored Swiss driver Jo Siffert. In Rush, the Heuer colors and crest are visible on the overalls of Niki Lauda (played by Daniel Brühl), his teammate Clay Regazzoni (Pierfrancesco Favino) and every other member of the Scuderia Ferrari crew, just as they were in 1976. The Swiss watchmaking brand, the world leader in prestigious and high-end chronographs since 1860, signed on as Official Timekeeper of Ferrari in 1971. Throughout the 70 - the golden age of Formula One - every Ferrari driver wore a Heuer chronograph with his name and blood group engraved on the case. In Rush, the brand’s colors once again bedeck the tracks at Nürburgring, during the German Grand Prix, at Monza for the Italian GP, and the season closer at the Fuji Speedway in Japan. TAG Heuer also loaned the production the F1 timing equipment used in the period. Developed by Jack Heuer for Ferrari, it was the first to measure to 1/1,000ths of a second and was subsequently used by most teams on the circuit. TAG Heuer has been a proud partner of McLaren team in Formula 1 since 1985, and holds the record of the longest standing sports watch brand sponsorship in history. Along the way it has timed the Indy 500 and partnered with Le Mans teams and sponsored ever major F1 racing legend from Ayrton Senna and Alain Prost to David Coulthard, Kimi Räikkönen, Fernando Alonso, Lewis Hamilton and today’s Vodafone McLaren Mercedes team of Jenson Button and Sergio Perez. The brand also supports F1 Swiss-French driver Romain Grosjean.